From your heart to hers, show her your deepest feelings with this 10k white gold and gemstone pendant. The heart shaped peridot at top is accented by prong-set round diamonds. This pendant hangs from an 18" cable chain in 10K white gold. 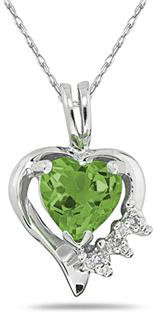 We guarantee our Heart-Shaped Peridot and Diamond Pendant, 10K White Gold to be high quality, authentic jewelry, as described above.